Double your #GivingTuesday impact by donating through Facebook fundraisers! Facebook is waiving processing fees for #GivingTuesday and the Gates Foundation is matching donations up to $1k per campaign (campaigns are fundraisers started by an individual on their own page) and $50k per nonprofit. 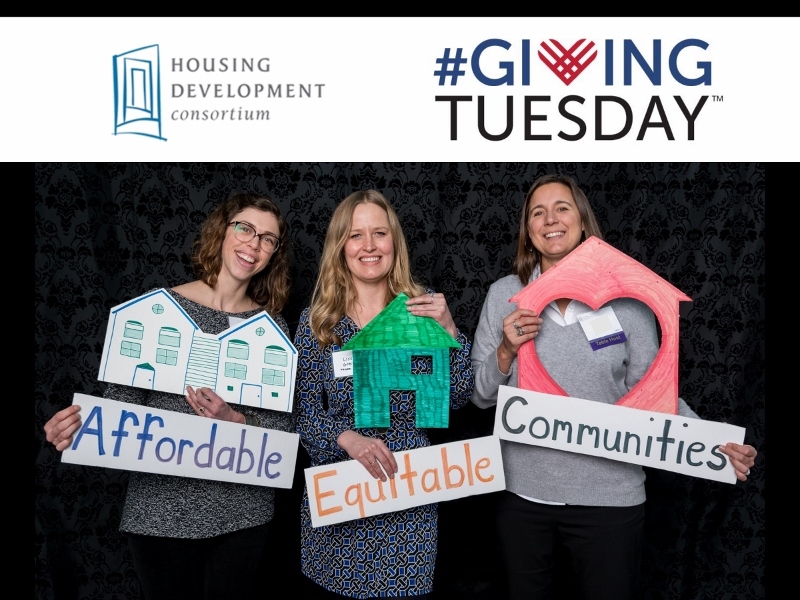 Our non-profit members are all great choices for housing advocates and if we may toot our own horn, we think we’re a good choice, too. Tweetstorm in the Forecast: The Senate is expected to vote on its tax reform bill this week, and it’s not much better than the House’s in terms of affordable housing. Our friends at WSHFC, KCHA, and SHA told the Seattle Times all about it and the National Low Income Housing Coalition (NLIHC) has organized a Tweetstorm beginning tomorrow at 11 am. Follow @HDC_SeaKC for local takes on this national issue and check out our online tax reform center here. Seattle Tech for Housing has been such a staple at community meetings that it is hard to believe they’re only a year old, but it’s the truth! Come celebrate their one year anniversary with happy hour tomorrow. Bellwether Housing & Plymouth Housing Group have a very cool collaboration in the works involving a zero-cost land transfer from Sound Transit. Only good news could come out of a place called Friendly Village, right? Right! Thanks to KCHA, 224 low-income senior households will stay in Redmond. Seattle Neighborhood groups have brought forth a lawsuit against the city for its planned MHA-activating upzones. Community members in Federal Way are coming up with their own solutions for their neighbors experiencing homelessness. Bellevue residents: Your planning commission needs you! Apply by 11/30. A full Seattle-budget rundown is up at the C is for Crank, and today the city announced new contract awards for homelessness services. What did we miss? Email us with suggestions. Send Housing Developments straight your inbox every Monday! Subscribe here.